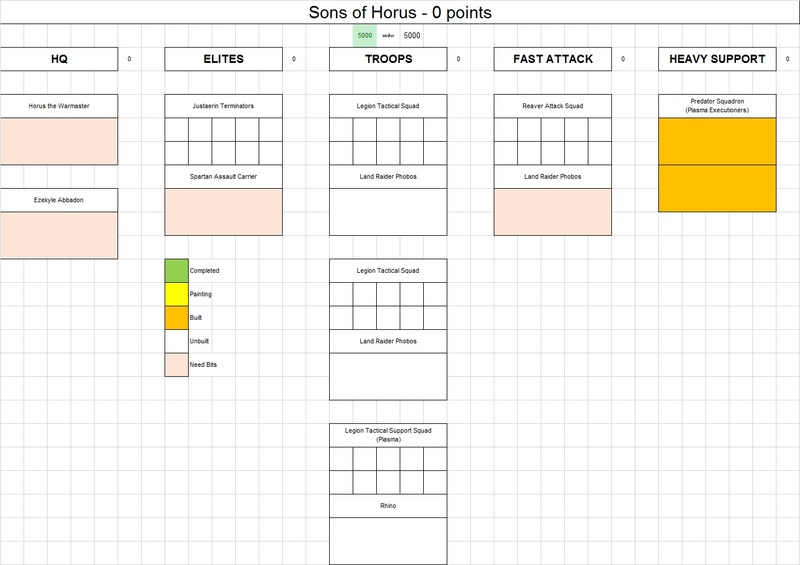 Mordian 7th Regiment: Heresy Era Sons of Horus - Project planning, and first models! Heresy Era Sons of Horus - Project planning, and first models! As I have alluded to recently, the next Horus Heresy project in the hopper is a Sons of Horus force. I place the blame for this squarely on the shoulders of Dave Taylor, who shared his SoH paint recipe for the recent NOVA Charitable Foundation raffle army and after painting up a helmet in that scheme being held by one of the Thallax models I'd done, and subsequently a test model, I was hooked! Whenever I start a new project I pencil together a quick painting chart to get a feel for what the army structure may look like and figure out what I have on-hand and what needs to be ordered. In this case I thought I'd do an Armoured Spearhead force as a counterpoint to the recent Orbital Assault Thousand Sons list. The RoW requires all infantry models to be mounted in a dedicated transport, and gives the option for any unit that could take a Rhino to instead be deployed in a Land Raider. As the Sons of Horus are known for their brutal assaults, I knew that I needed to run the Phobos variants to take advantage of the assault ramps, and while the Mk.IIb Land Raider from Forge World has a little Heresy flavor, what really sealed the deal was the unveiling of a new set of track kits from Blood and Skulls industries, providing wrap-around track sections akin to my beloved Proteus models! I have a trio of these kits winging their way to me as we speak, and picked up a pair of the Mk.IIb Land Raider kits from the FW booth at NOVA a few weeks back, can't wait to get 'em combined! I'd placed a FW order a week or so ago for the majority of the infantry bits and kits that I'll need to get rolling (and have gottend a shipping notification that they're on the way, woo! ), and will have to place one more order in the upcoming weeks to pick up the last of the requisite models including the big man himself, the Abbadon/Loken set, a Spartan and the third Mk.IIb raider. Not a lot of models, but it's going to be a pricey order! The force is also going to have a strong plasma element to it - I'm envisioning using a hot red/orange on the plasma coils to set off against the cooler seafoam green of the armor, and as such I dug out a couple tanks that have been lurking in the Closet of Doom for years. 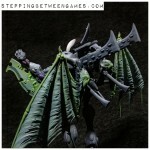 A pair of Predator Plasma Executioners! I'd run a pair of them in one of the earlier iterations of the Thousand Sons and they were pretty fierce - I'd picked up a few more intending to use them on the recent Thousand Sons force but when I switched gears to go Orbital Assault with 'em they ended up languishing in a box instead. Happy to have a chance to use them in the new SoH force! Still gotta get the tracks on them, but other than that they went together like a dream - only had to break out the heat gun for one side panel, everything else lined up really well. Hoping to get the builds finished over the next few evenings and get 'em primered over the weekend. Maybe get some paint on 'em too! Excited to see this army! And so it begins . . . . . .
@DaveTaylor: Me too! After seeing how cool the NOCF army turned out I am really jazzed to get stuck in! @Riot: Haha! Indeed, I'm doooooomed. That's kind of closet of doom everyone should have. The kind where you wake up one day and fancy a pair of predator executioners and they are, waiting for you. I hope this becomes next years NOVA army so I can see it in person, but I bet you will have painted a dozen more before then! I'm reading Vengeful Spirit at the moment so looking forward to this. Those Predators are gorgeous. Goodness.... And so it starts again. SoH are a good looking legion done right. And I believe you'll do just that. Looking forward to this one mate. @John Stiening: We'll see how it goes, like any good project this small boutique army has the potential to expand into a 10,000 point monster that I may still be working on in September. Hah! @Monkeychuka: Thanks very much, man! @Dai: Hah! Gotta keep things fresh - Hoping to use some new tricks and techniques that I've picked up since the last couple projects! Those Blood & Skulls tracks are very tempting! haha nice man .. it beats my process of just buying whatever catches my eye. I plan none of it 8) Though I am pretty sad I didn't see the tracks! argh... Looking forward to seeing it come together man! @Dave Henderson: Indeed, I couldn't resist! @Todd Sherman: Haha! There ends up being a little of that method too! 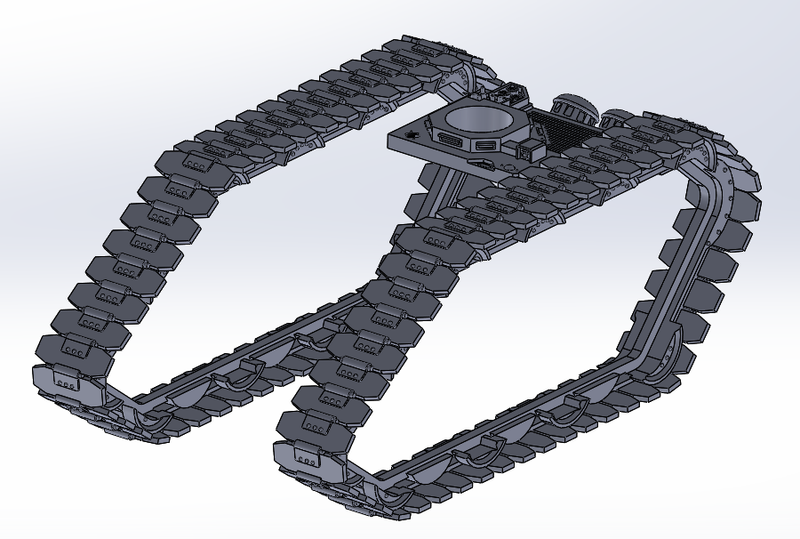 @Siph_Horridus: The spartan has been ordered, so there's gonna be a wodge of assembly nightmare in my future!